Discover the mysterious island at your own pace. Interact with wildlife, search for hidden items or simply take in the sights and sounds. 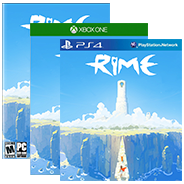 Make your way through the ancient ruins by solving puzzles with sound, light, perspective, platforming, and even time manipulation. Dive deeper into the boy’s backstory by uncovering dozens of secrets and collectables. Take in beautiful, Mediterranean-inspired terrain complemented by the captivating music of David García Díaz.